NEED a BRAIN for your BLONDE? If you want the missing link between your filtertron'd Hollowbody and vintage bassman amp, namely the RE-301 space echo, to get that blonde ol' stray cat sound.. I built this Pre-amp to have that particular catalyst and the mojo of what a 301's input circuit does to the gretsch guitar and blonde fender.. This is indeed a pre-amp, not an "FX" box, its not a boost or drive box. It causes the guitar to be heard better by the normal channel of a blonde 63' bassman..(the Dyno Brain and Atomic brain also work well with a wide variety of tube amps) I've spent yrs trying to make this happen, I'm no engineer, just a singer-guitarist with one sound in my ears I had to have... so I'm making em' 1 at a time! Very spooky, especially seeing as the original uses a LM741 single opamp and I only used the double because it seems more people are stocked up on them now, and they're really no more expensive for the common ones. Did you make the vero from my schematic at fsb.org? Ha ha ignore my last comment, I was talking about the other layout I did yesterday! DOH! Yes I used the scheme that electromatic showed on his layout. Hi Mark. On said schematic on FSB, there is a 0.1uf cap on the tone control from lugs 3 to 1 and a 100pf cap on the in lug to the wiper. Are they not needed? Yes they are needed, but I hate mounting components on pots so they're on the board. I found a gutshot of a atomic brain on ebay, seems there´s not much difference. Would be cool if we could work out how it works. i updated the thread yesterday with a pic. It´s verified. But i have the same strange problem, I had with the other vero before. There´s some noise when the effect is engaged. Hmmm weird. It sounds like noise you can sometimes get from oscillators but there is no oscillator in this. Do you get the noise if you run it off a battery and mains? Ok, i found the problem. I boxed it up and the noise is gone?! Maybe it was a Grounding issues? Hi G5120fx. How does this version with the LM1458 sound compared with the 741? Intersil list the LM1458 (or CA1458 for their version) as the dual version of the LM741 so they should be pretty close. I used a ts4558 i had laying around, sounds pretty close too. i already ordered a lm1458, so i´ll report when i got it! Hi Paul.D1 on the original traced schematic is a 4001. 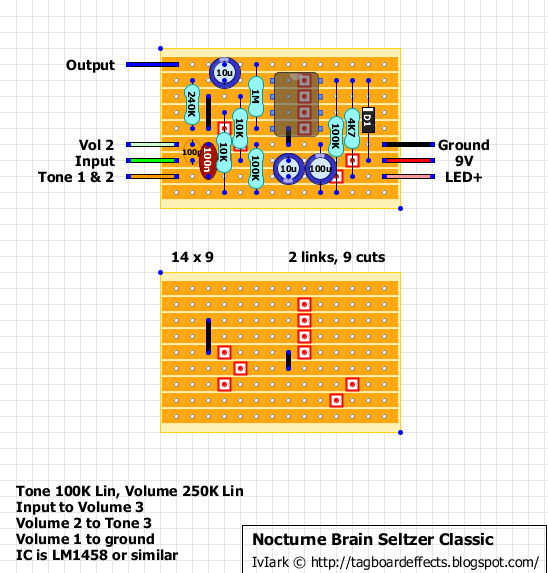 Anyone know how this differs from the new Dyno Brain circuit, which was apparently modified to accommodate more guitar pickups, and increase gain? Where does the neg side of the led connect to? I connected mine to the top left corner of the 3pdt then to the positive side of the power jack and all I'm getting is a loud buzz when plugged in. Yes that is correct, but the positive side needs to go to "LED+" on the board. If you connect it directly to the supply without a limiting resistor the LED will burn out in a couple of seconds. gotcha, it had to be something wrong with the offboard wiring. I put all the jacks and switches in the box first then soldered the leads to them. I've since taken everything out and will wire everything up first. -If i dont have a 2.2K around, could I use something similar in instead? The LED resistor is already on the board, that layout pic assumes there isn't one on the board. So just take the LED+ connection directly to the LED anode as you have shown in your diagram, but leave out the 2K2 and connected wire completely. Thanks Mark, you sir are a gentleman and a scholar. I believe my picture is now correct? Not quite, you need to remove the wire to the DC socket. Hello IvIark, thanks a lot for the Layout. I've ordered the parts and will try it immediately. But do you know whats different in the circuit of the dyna brain? Or even better: the atomic brain? The Seltzer Classic Circuit is pretty basic. So the changes shouldn't be dramatic. What do you think? Good question... I'm curious what the difference is as well. Interesting question indeed.. But i can't find any schematics other than this. You guys find any? I've been searching as well as I don't have a blonde fender amp unfortunately, anyone got any ideas for the Dyna or the Atomic? Which is the correct way to wiring the input and the tone in this circuit ? 1 is right, the input wire has to daisy chain to volume 3 from the board. Or you can take 2 wires from the lug of the switch, or 2 wires from Volume 3. Whichever is easiest for your build. Hi everybody ! 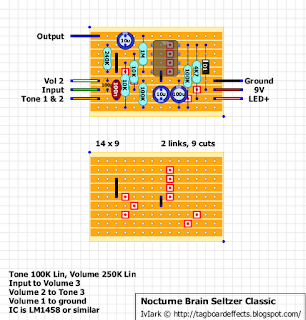 Could you send me the correct complete layout with the pots and stomp switch wiring! Please ! I just bought the kit and the circuit is ready but don t work at all . I know i ve made a mistake on grounds wiring pr in stomp switch wiring but don t know where! yesterday i built the the pre-amp and it gives a nice little bit more twang. Unfortunatly the tone control does not work, do you have an idea what could be te issue ? It seems the tone control or "Bass Cut" has little effect for most people. I chose to just omit it. I got my layout form FreeStompb**s.org. It is is a great circuit though and I pretty much leave it on all the time. You will need to experiment with pedal placement though, it can act weird with other pedals. If you want to build your own pcb. I'm new in DIY and also blond !! I started to buid this preamp but i can't find where to plug the jacks connectors, the minus point of the power supply. Could you please help me or just send a picture of the finished oui product ? Thanks so much for this fast and very clear answer. I hope I can test my new stomp soon ! I'm a bit disappointed, I thought I followed well the instructions but when I test it I just have a hum but no any signal. The led is working but with a quite low light. The switch seems to work but this is all what I can get. You will find here after a link to 2 pictures, perhaps you can spend some minutes to check and help me. I hope ! It looks like you may have wired up one of the jack sockets incorrectly. The wires appear to be on the 'switched' side, i.e. they are disconnected when the jack is plugged in. Thanks for your answer, both jacks were connected the opposite way. So now I have a signal but when the led is on it's like bypassed. I mean that the signal is like the dry one and the volume potentiometer does nothing. When the led is off, I have no more signal just an oscillation noise. Both, volume and tone potentiometers does nothing at all. Do you think the switch is connected opposite way ? Is this preamp true bypass or not ? Because when I switch off the power supply I have the dry signal. I checked many times the drawing, the cut on the board and so on but found no problem. That's strange. Thanks to all of you for your help. If I find a solution I'll keep you informed but as brand new in this field I'm not so confident. You'll find 99% of the schematics for layouts on here at freestompboxes. Check out the thread at that site. Thanks for the info MIguel, it should be useful for anyone else who might need to mod it to make it work with their gear. Hey guys, not exactly new to building pedals, but I tend to take long breaks and forget a ton and have to relearn stuff every time I start back up...can some one help me with the capacitors? I know the round ones are radials, but on this schematic in particular, does the orange oval mean its a disc and the maroon oval mean its a drop? and if so, why can't I find a 100n cap anywhere? Do I have to shop for it as a .0001u or something? just need some help sourcing please lol thanks to any replies in advance. It's the value of the cap thats important, not the material it's made of. In this case the 100pF cap is the small orange oval. These are small and easy to fit into a 2.5mill span. The 100n cap (maroon) can be a metal film type or a poly box type. Again it doesn't matter which...but a Poly box cap would physically fit into that space better as they are usually 5mill pitch and low profile. The metal film types are a lot bulkier. They will still work but they won't fit in as snug as a poly box. with a small link connect lugs 1&2 on the tone pot, and from those take one more wire(double link on lug1 or 2) and sent it to where tone1&2 is on the board. take a wire from where vol2 is on the board, sent it to vol pot lug2 and with an other wire-double link on that lug2 go to tone 3. from vol pot lug1 take a wire to any ground spot you want. the green input wire must go to vol pot lug3 and from that same lug 3 you get your input wire going to stompswitch with an other wire.. Thank you , so much. I will read the vero build guide now. This site is so huge i havent known where to start. maybe i jumped in the a little deep. any time buddy. this is not just a great sounding build, but it's also not that complicated of a build. definitely a great one to start off with. while there is so much info here, everyone starts at the same point, and there's a learning curve. the more you build the more you'll learn, and you'll start to want to find out more info so you'll read more, and things fall into place. just don't forget to ask for help if you need it, cause sometimes it can get really frustrating. would rather see someone else get into building and enjoy it then just give up. Just built this one and trying to troubleshoot. Bypass works, but no sound when engaged. However when I remove the IC (from its socket) I get a low effect signal at about 50% volume, also can be controlled but the volume pot. IC is orientated correctly and believe is working. Need to get a replacement to rule that out, but wondering if there might be something else. Voltages on the IC pins 1-4 and 8? The chips I had were bad, got new chips from a different supplier and it works. soo...anyone done the Atomic Brain with the Abby mode yet?